Cross-examination of former Virginia Gov. 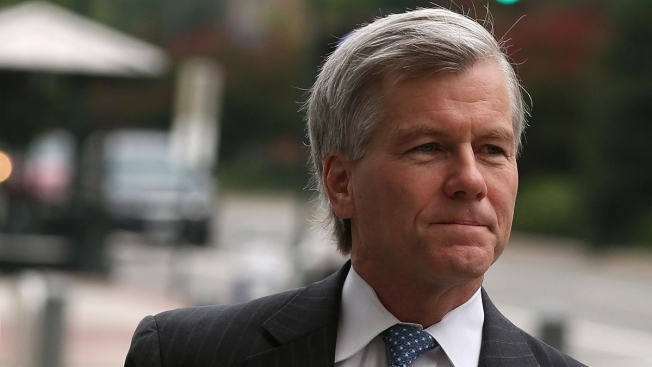 Bob McDonnell ended Tuesday afternoon in the corruption trial of McDonnell and his wife, Maureen. But that was not before the ex-governor faced the most pointed questions yet. The jury could get the case by the end of the week, Northern Virginia Bureau Chief Julie Carey reported. Bob McDonnell's defense has one more witness, and Maureen McDonnell's defense says it needs only three hours. "I love my wife," Bob McDonnell said as he left court Tuesday. "I've known her 41 years, and it's been a very, very difficult period." The prosecution grilled the former governor on the specific timeline of when he received the gifts and loans from businessman Jonnie Williams, trying to make the case that it lines up with McDonnell promoting Williams' company and its tobacco-based supplement Anatabloc. But on the stand McDonnell was adamant that the money he received from Williams in 2012 was for MoBo, the small real estate company he owned with his sister -- not for him personally and not in exchange for favors. For most of the day, prosecutors asked Bob McDonnell about a series of emails and notes in February 2012 in which McDonnell was trying to finalize a $50,000 loan from Williams to MoBo. While that was going on, the McDonnells prodded state officials about doing research to help Anatabloc, prosecutors said. Tuesday marked the 22nd day of the trial of the former first couple of Virginia, who are charged with accepting more than $177,000 in gifts and loans from Williams, the former CEO of Star Scientific Inc. Prosecutors allege those gifts were in exchange for promoting Anatabloc. At one point, the judge expressed frustration at how long the trial is taking. "Everybody, let's tighten this up," he shouted. Jurors were shown emails that were sent six minutes apart. McDonnell asked Williams about documents to finalize the $50,000 loan, and then told his staffer to "see me about [A]natabloc issues" at Virginia Commonwealth University and the University of Virginia. McDonnell responded forcefully when questioned about the emails. The most he did for Williams, he said, was trying to get in him touch with the proper people who could evaluate his request. "We don't make decisions based on money. No sir," McDonnell said. Prosecutor Michael Dry also asked him about a former administration official's testimony that he asked her to meet with representatives of Williams' company nine days after the $50,000 check was deposited into a MoBo account. McDonnell said he did not remember making such a request. McDonnell said his email to his staffer and lawyer, Jason Eige, was "to ask him to get a phone call returned, which I've done thousands of times. It's basic constituent service." Jurors also saw an email that Maureen McDonnell sent to Eige earlier that month in which she wrote, "Gov wants to know why nothing has developed w[ith] studies after Jonnie gave $200,000. I'm just trying to talk w[ith] Jonnie[.] Gov wants to get this going w[ith] VCU MCV. Pls let us know what u find out after we return." The email then provides Williams' cell phone number. Under the timeline developed by prosecutors, Maureen McDonnell sent the email while she and the governor were riding in a car together to a political event. Bob McDonnell said he was not pressing for information on the studies, and he didn't know why his wife said as much in an email. Prosecutor Michael Dry responded with incredulity. "Your wife was misleading one of your most trusted advisers?" Dry said. "I don't know. I'm saying that is not true," McDonnell said. He testified last week that Williams deserved at least a returned phone call, even if VCU and U.Va. had no interest in studying Anatabloc. Instead of making a cash loan, Williams initially proposed letting McDonnell borrow shares of Star Scientific stock that he could use as collateral for a loan from a brokerage. McDonnell denied that the stock transfer was scrubbed because it would have triggered public reporting requirements, saying he was still negotiating with Williams when the check arrived to help with the two Virginia Beach vacation rental properties McDonnell owns with his sister. The prosecution showed evidence of text messages, emails and handwritten notes that McDonnell kept, showing he and Williams discussing a stock loan transfer in early 2012. McDonnell's notes suggest that Williams could not sell some of his own stock so he'd transfer it. That would've given the McDonnells thousands of dollars more. In court Thursday, a prosecutor asked, "In essence [you'd get] $187,000 worth and all you have to pay him [Williams] back is $110,000?" McDonnell responded, "I don't know, sir. This is a proposal that never happened.... It was a discussion." The properties lost $40,000 to $60,000 annually. McDonnell rejected Dry's suggestion that those losses were not sustainable, saying the goal was to build equity over the long haul. Dry then played a television interview from 2012 that showed McDonnell talking about cutting spending to balance the state budget. McDonnell told a Fox News interviewer that government has to balance its checkbook just like people do at home. "You can't spend more than you have for any period of time or you go broke," McDonnell said. During re-direct, McDonnell's lawyer asked, "Did you in fact balance the state budget?" McDonnell responded, "Four years in a row.... My team did a great job." During cross-examination, Dry also questioned McDonnell closely on the status of his friendship with Williams. Prosecutors allege that Williams was not so much a personal friend to McDonnell as he was a source of cash to the McDonnells, who carried large personal debts. They pointed out numerous documents and emails in which McDonnell routinely misspelled Williams' first name. Dry even mocked McDonnell at times Tuesday, spotlighting the many times the then-governor misspelled his "friend's" name as Johnnie instead of Jonnie. Dry asked sarcastically, "Is it typical you don't know how to spell your friends' names?" "I misspelled his name, yes sir," McDonnell said. "I've misspelled other people's names." Prosecutor again spotlights fact that #McDonnell still misspells "Johnnie" Williams name in the May 2012 thank you text for a $20K loan. During re-direct, McDonnell's defense attorney revisited the points made by the prosecution and let Bob McDonnell shed further light into his marriage with Maureen. The former governor said there was tension on a Florida getaway in March 2012, and that the couple spent a lot of time reading. He also said he went to Jeanine, their eldest daughter, to vent. "I told her I was worried about her mom because of these chronic flashes of anger," he said. In response to images of the couple holding hands while going in and out of court a few months ago, McDonnell's defense attorney asked, "Does that reflect some difference in the true nature of your relationship?" He also said being charged in the corruption case in January was "crushing." "We haven't had more than a speeding ticket... [T]o be charged with 14 felonies was just a crushing experience for my wife and I, of course I wanted to support her; she wanted to support me," he said. His defense attorney asked, "Have you learned more [about your wife] in real time?" McDonnell replied, "Yes, I have." The defense is claiming all the evidence handed over to them by the prosecution came 45 days before the trial, as was required. As McDonnell went through the pictures, text messages and emails, the defense claims the former first couple's relationship worsened. The defense also pointed out that no search warrant was executed to get all the evidence from McDonnell. "I had nothing to hide," he said. "I was happy to hand them over."